We have prepared a new game for you based on Enchantimals and you can play it on PC or on mobile phones and tablets. It is a memory game in which you will have to find the hidden pairs in these cards. The cards are face down and you will have to turn around, trying to find the ones that are the same and match them. You will have to be very skillful and demonstrate a great ability to memorize images. The first levels are simple but, little by little, the level will increase with even more cards to be paired. Do not wait any longer to have fun with Enchantimals and its memory game. It is an original game of Fandejuegos and you will only find it here. 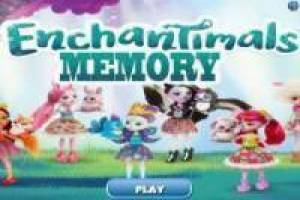 Enjoy the game Enchantimals Memory, it's free, it's one of our girls games we've selected.